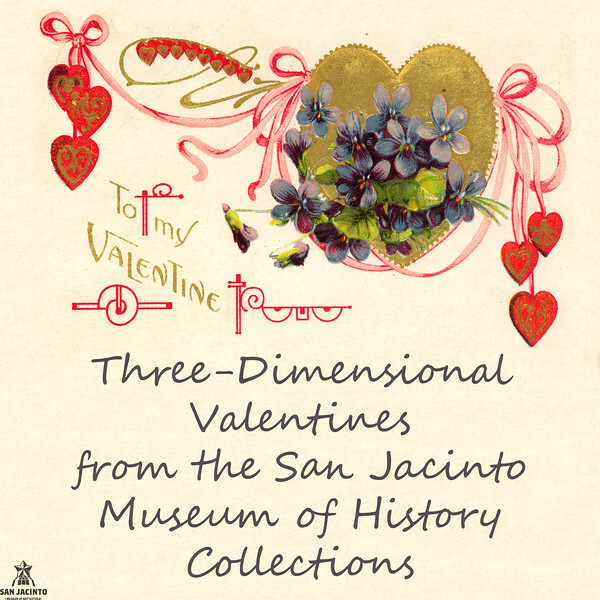 Three-dimensional valentine cards from the San Jacinto Museum of History's collections. 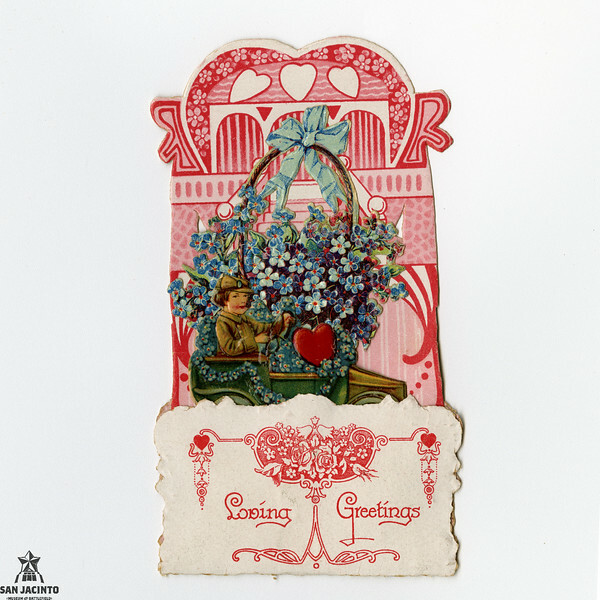 The custom of sending manufactured valentine cards began during the Victorian period, when postage costs in Great Britain dropped, and new color printing techniques were developed. 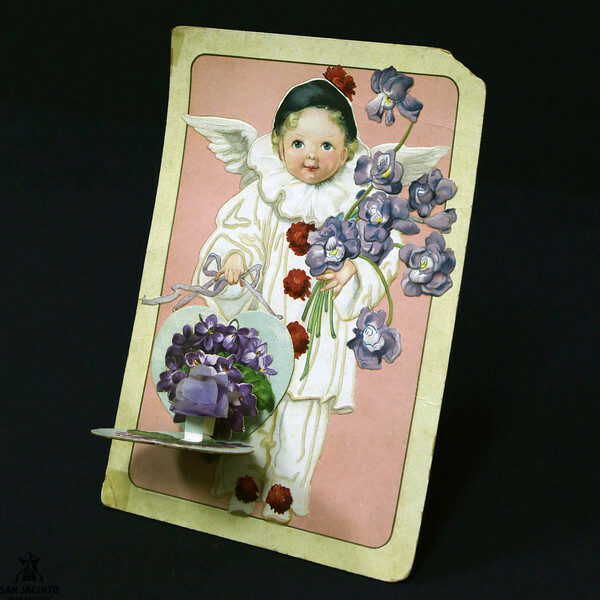 People in the United States followed the British trend, with the most popular valentines of the late 19th and early 20th centuries being ones made to fold flat, and to pull out and stand up. Many of them were printed in Germany, and cost between five cents and a dollar. Others were made in the U.S. 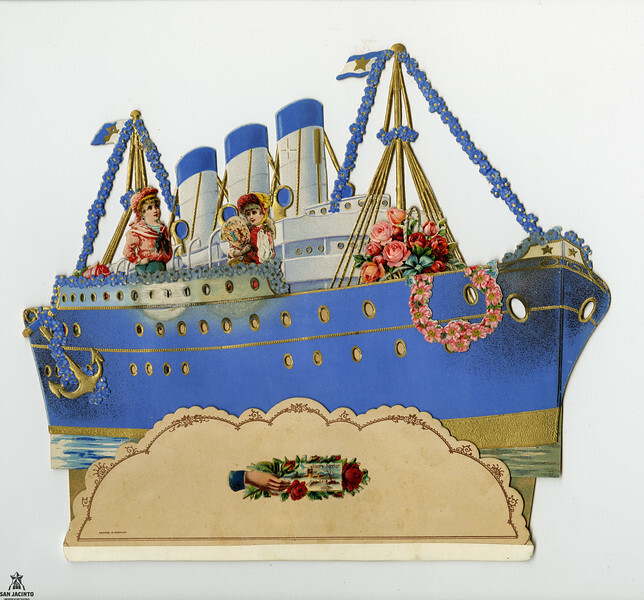 Shown here are some of the three-dimensional valentines from the San Jacinto Museum of History's Albert and Ethel Herzstein Library. 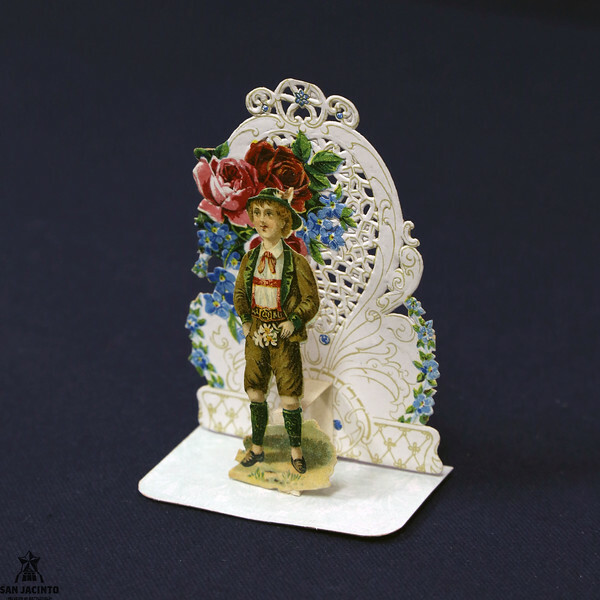 Standing valentine card, made by Rafael Tuck & Sons, Ltd. of London, Paris, Berlin, New York and Montreal; printed in Germany. Opens to 4 1/4 inches high x 3 1/4 inches wide x 1 3/4 inches deep. Note the strip of cardboard attached behind the boy's knee, that allows the card to stand upright. 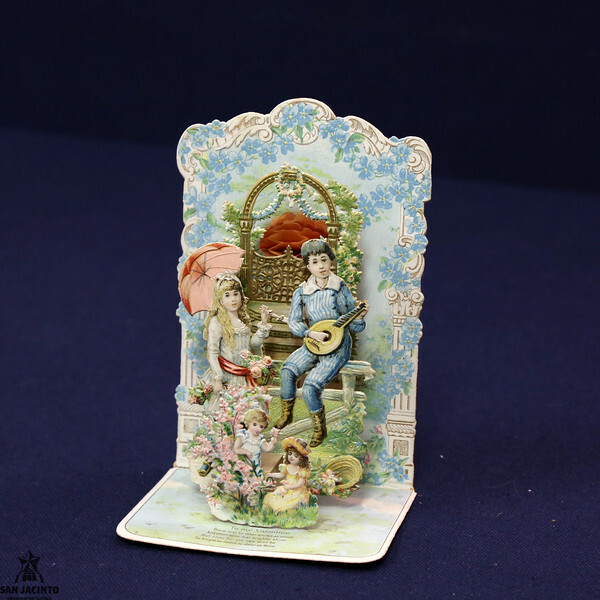 Standing valentine card, made by Rafael Tuck & Sons, Ltd. 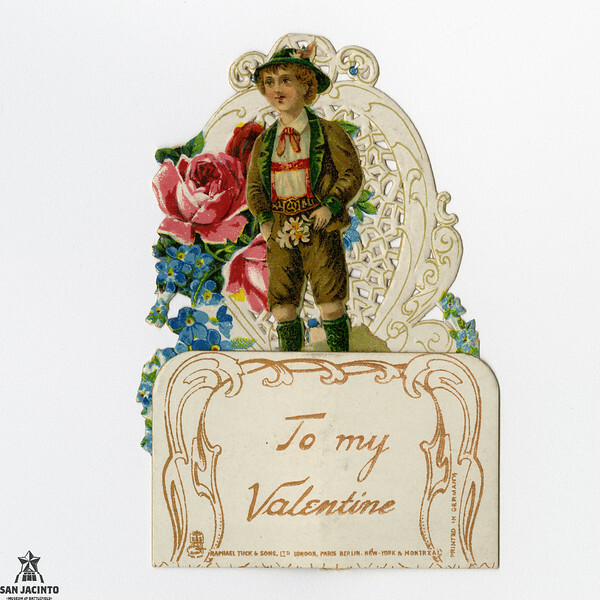 This valentine has a cardboard stand attached to the back, and was printed for Rafael Tuck & Sons, Ltd., in Germany. 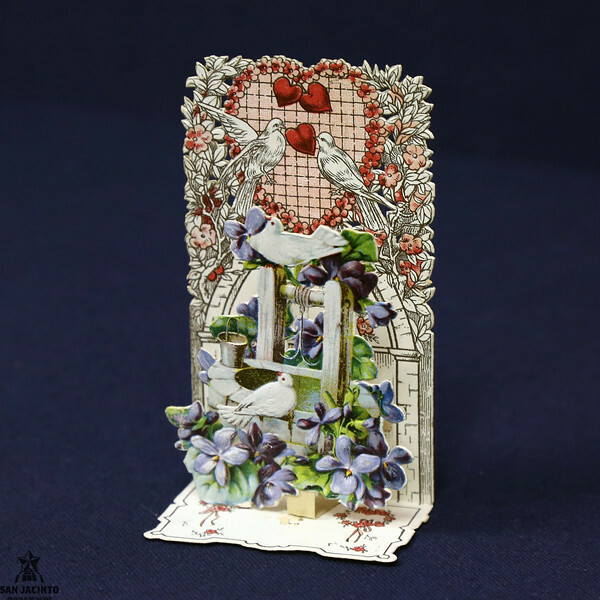 The card is 8 inches high and 5 inches wide, and a heart-shaped leaf opens to reveal a bouquet of three-dimensional violets. Three-dimensional valentine, 3 3/4 inches high x 5 1/2 inches wide. 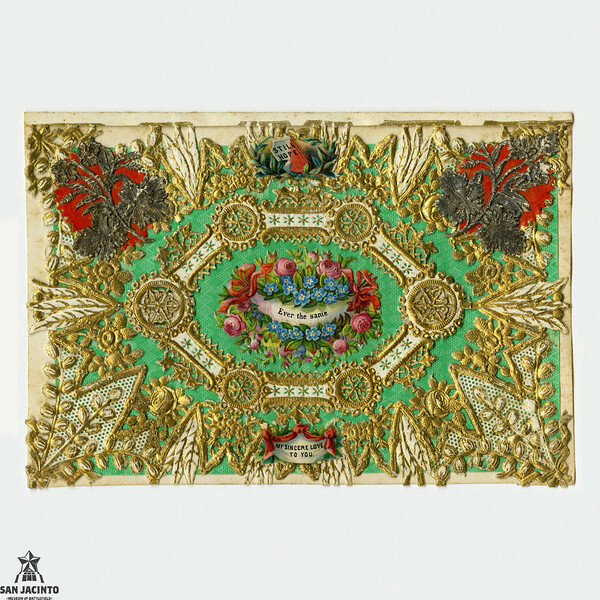 Gold and white paper lace on top of a green background, topped with color cutouts, with the text Still hope, Ever the same, and My sincere love to you. The oval white and gold band around the center bouquet expands outward 1 inch. 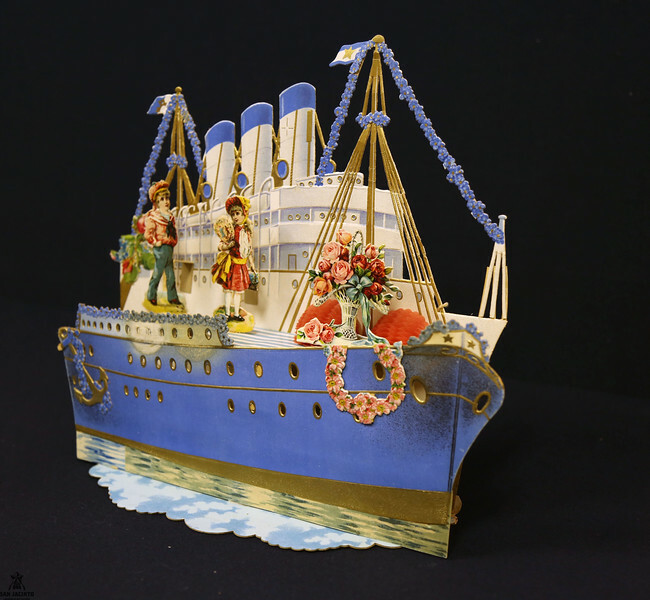 Made by the Whitney Valentine Company, which began making valentines in Worcester, Massachusetts, in 1866, and expanded to Boston, New York, and Chicago by 1888. 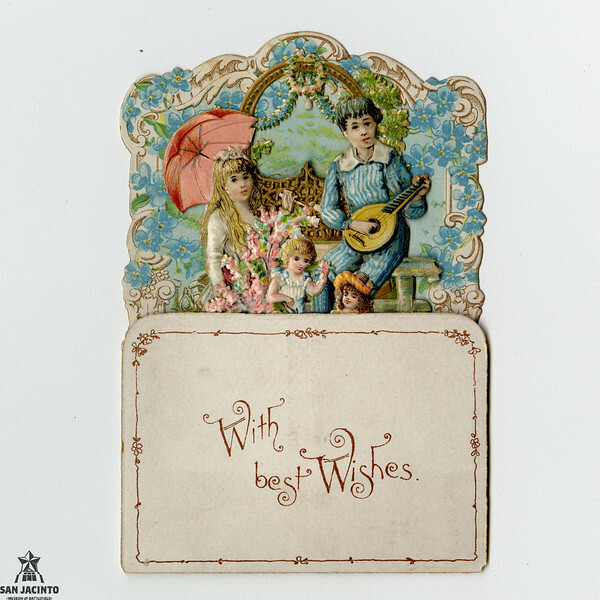 The card opens to a small poem. Where happy clouds would lower. Will shine where'er I stray. Standing three-dimensional valentine, open. Printed in Germany. 10 1/4 inches high x 12 inches wide x 3 1/2 inches deep. 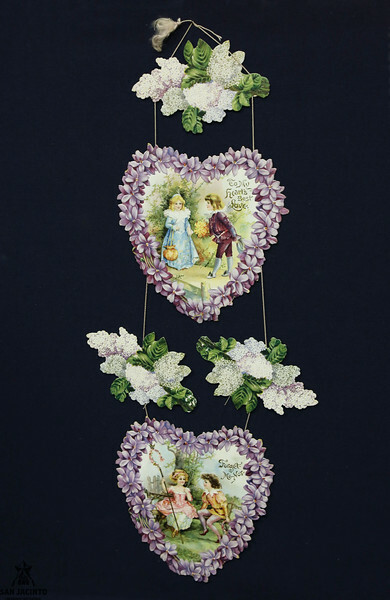 Large format valentines were popular in the early 20th century. Three-dimensional valentine, closed. Printed in Germany. 10 1/4 inches high x 12 inches wide. 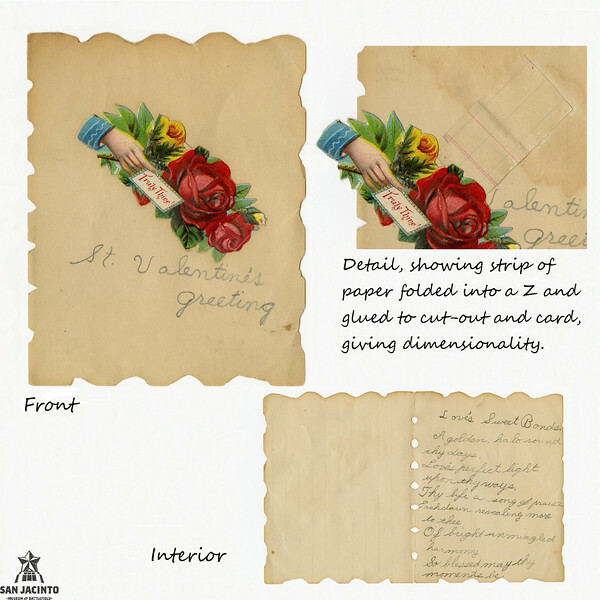 Three-dimensional valentine, opened. 7 inches high x 4 1/4 inches wide x 3 5/8 inches deep. Transparent purple window set into the background. Blue flower horseshoe with four-leaf clovers and roses, fronted with a golden gate. Written on back: To Mamma from Wilbur. 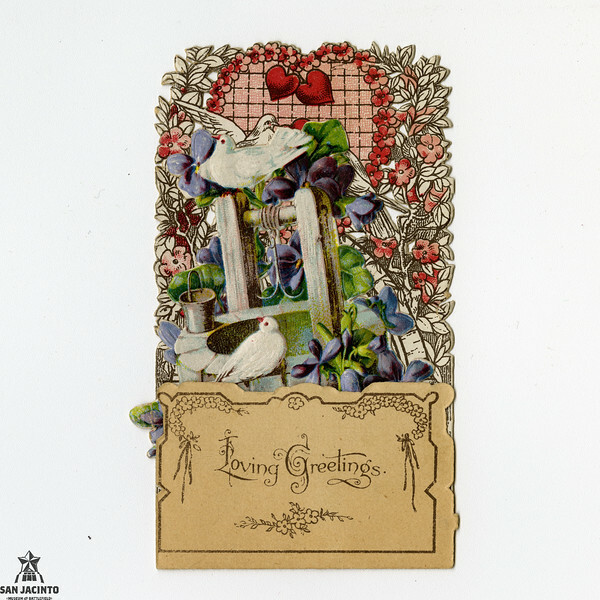 Three-dimensional valentine, closed. 7 inches high x 4 1/4 inches wide. Transparent purple window. Hanging valentine, To My Heart's Best Love in the upper heart, Forget-Me-Not in the lower heart. Large hearts: 6 3/4 inches high x 6 1/2 inches wide. Total height: 22 1/4 inches. Circa 1900. 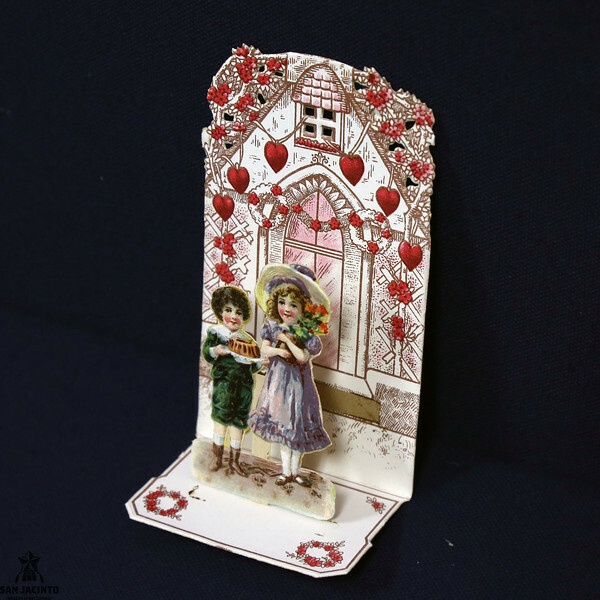 Hand-made three-dimensional valentine, using a lithographed illustration and lined paper. Written on back: from Mary to Wilbur. Closed, 5 1/8 inches high x 4 inches wide, expanding to 1 inch deep. A golden halo round thy days. Love's perfect light upon thy ways. So blessed may thy moments be. 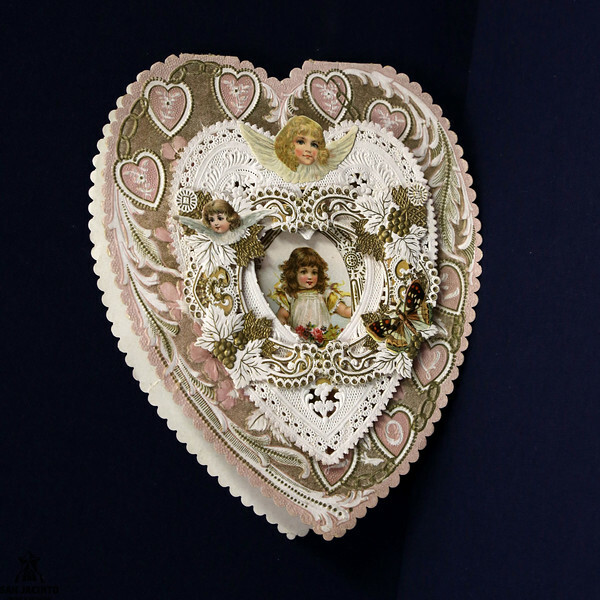 This 8 1/2 inch high x 7 inch wide heart-shaped card has three layers: a large pink, gold and white scalloped heart with a little girl in the center; a white lacy heart with a blond cherub's head that expands out 1 inch; and a gold and white lacy rectangle with leaves, a butterfly, and a cherub that can expand out another inch. And my love for thee. 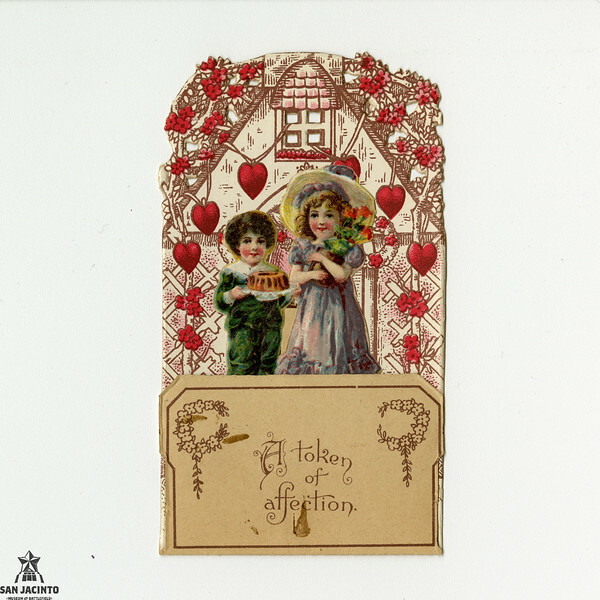 Sachet valentine, 4 inches high x 3 1/3 inches wide. 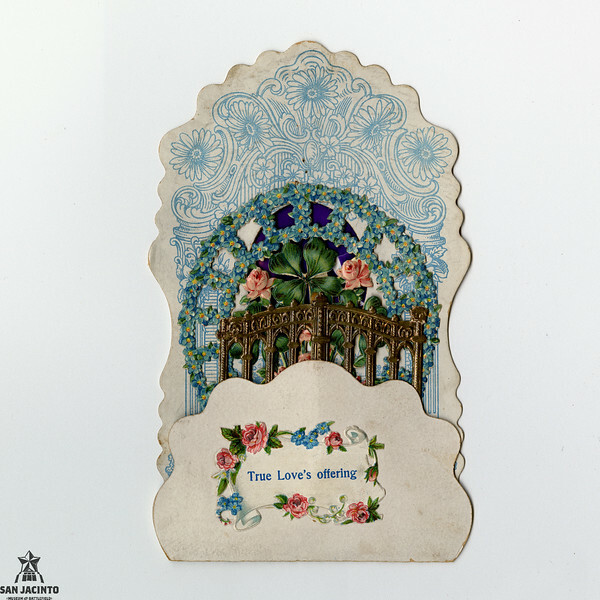 The inside contains a sheer cloth panel, printed with a poem, trimmed in paper lace. A scented sachet was originally behind the sheer fabric. Circa 1880-1890. I ne'er will wed another swain. And soon, oh, soon relieve my anguish. Three-dimensional valentine, opened. 5 inches high x 3 1/3 inches wide x 2 inches deep. so bright, so sweet, so dear as thine. 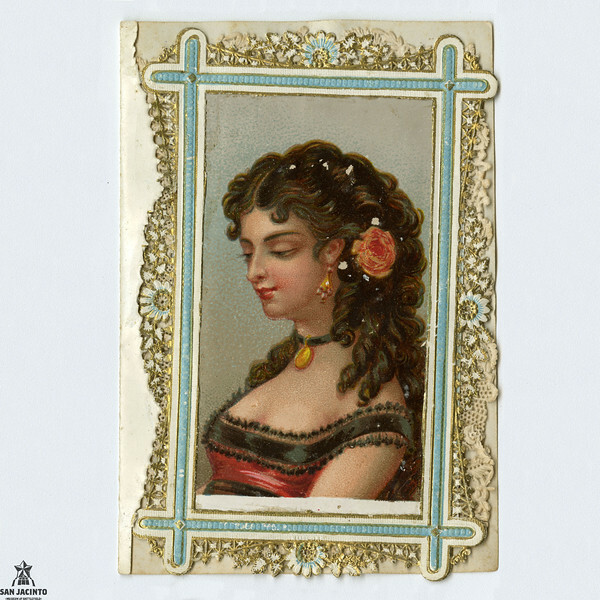 Three-dimensional valentine, closed. 5 inches high x 3 1/3 inches wide. This example is particularly well designed to have the different graphic elements attractively visible while open or closed. 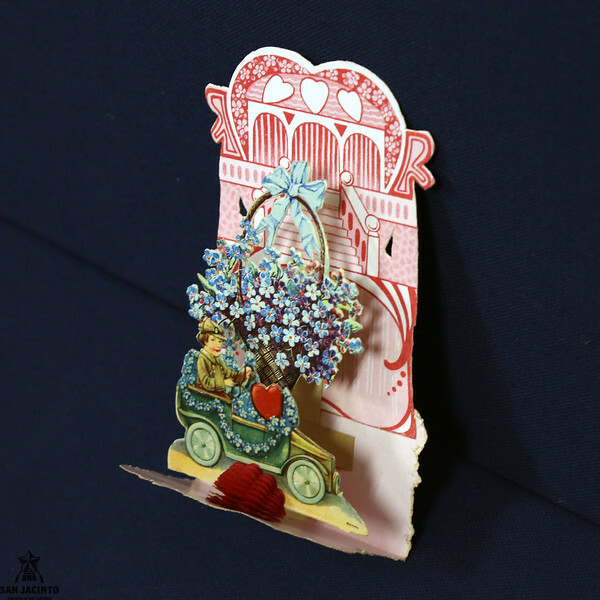 Three-dimensional valentine with an automobile, opened to 6 inches high x 3 3/8 inches wide x 2 inches deep. Printed in Germany. Written on back: To Mark Grube from Paul Gierhart. Threedimensional valentineopened to 6 inches high x 3 38 inches wide x 2 inches deep.Printed in Germany.Written on back To Mark Grube from Paul Gierhart. 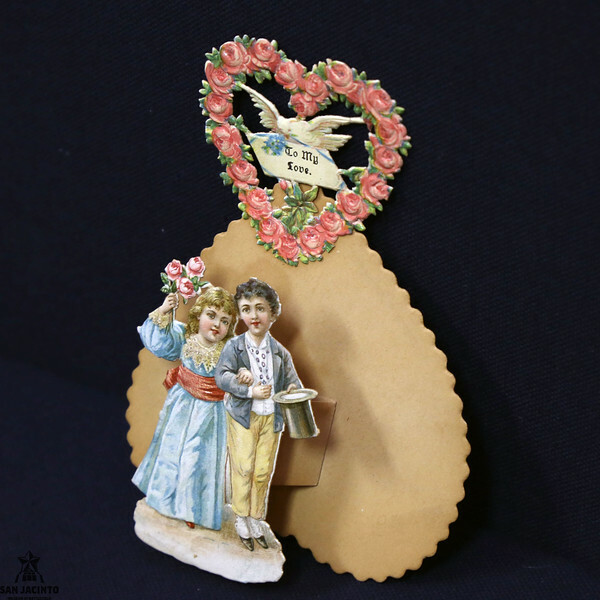 Three-dimensional valentine, closed to 6 inches high x 3 3/8 inches wide. Printed in Germany. Three-dimensional valentine, 5 1/8 inches high x 3 3/4 inches wide, expanding to 3/4 inch deep. Written on back: To Wilbur from Arthur. 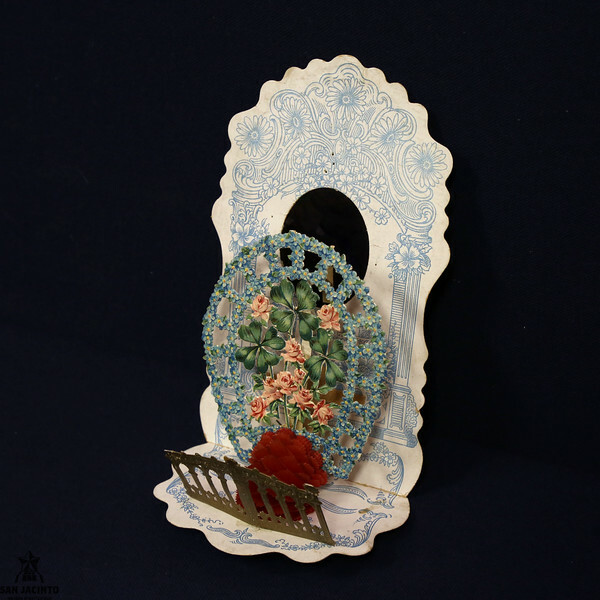 Three-dimensional wishing well valentine, opened to 4 1/8 inches high x 2 5/8 inches wide x 1 1/8 inches deep. 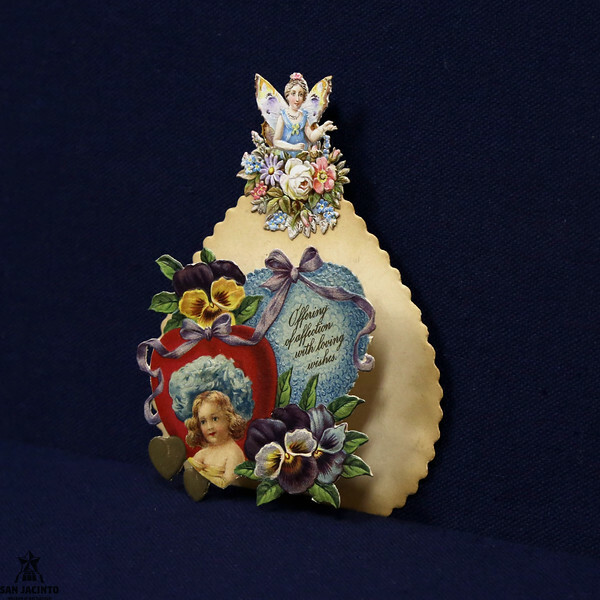 Inscribed on back: To Mama from G.
Three-dimensional wishing well valentine, closed to 4 1/8 inches high x 2 5/8 inches wide. Three-dimensional valentine, expands to 4 3/4 inches high x 3 3/4 inches wide x 1 inch deep. Written on back: To Wilbur from Gladys. Offering of affection with loving wishes. Three-dimensional valentine, opened to 4 2/3 inches high x 2 5/8 inches wide x 1 5/8 inches deep. Printed in Germany. Inscribed on back: From Granma. Three-dimensional valentine, closed to 4 2/3 inches high x 2 5/8 inches wide.